Bliss is the first EP album by Ink Waruntorn which tells the love story of life. The singer’s voice brings out in a beautiful, cheerful mood. The music is slow, relaxing which features electronic and synthpop melodies that blend well in between to express the mood of the songs to listeners. 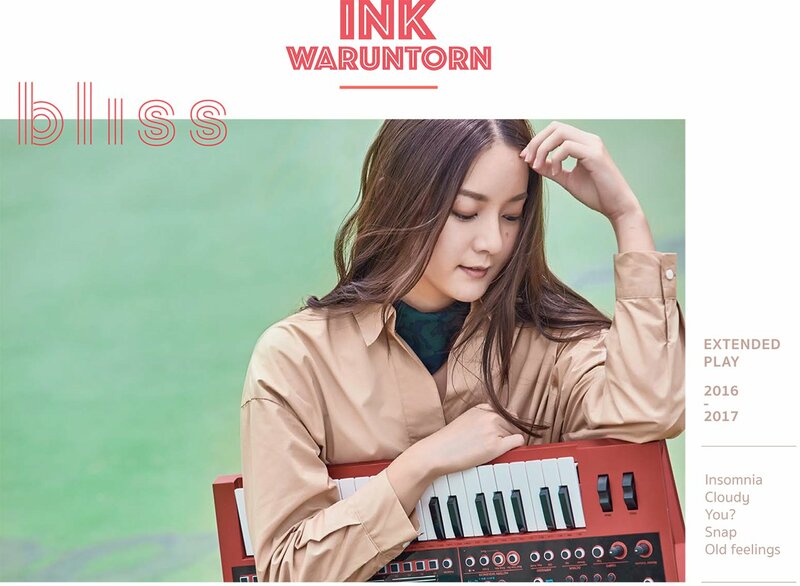 The synthesizer drum beats in some of Ink Waruntorn songs are quite similar to the synthesizer effect used in the Japan 80s music, if you listen to ‘You’, ‘Snap’, you know what I meant. This is a one of a kind of Asian pop song from Thailand. Bliss Album consist of five songs, with four of which were previously released in 2016 & 2017 are hit songs. Ink Waruntorn new song ‘Old Feeling’ added to the album featured a more mellow taste music style. Let’s check out the 5 songs from the Bliss EP by Ink Waruntorn. I think this is a really good album for collection. Let’s hear it and you’ll judge all the songs by yourself. There are 5 music videos below. BLISS EP CD album can be purchased for 290.00 Baht at Muzik Move Store, but it’s only available for Thailand address. Too bad. I’m looking for a way to get it back to Malaysia through courier. In case, you are into Ink Waruntorn but can’t get the CD album from your country, you can listen to it via Spotify at the moment. Other alternative if you don’t mind about the sound quality, you can listen or download the MP3 via iTunes store. Aged 24 from Bangkok, Thailand, Ink Waruntorn, known as Waruntorn Paonil is also an actress who was nominated in 2015 for her drama ‘Snap’. She was nominated the ‘Best Newcomer’ in The 10th Asian Film Awards, ‘Best Actress’ of 25th Thailand National Film Association Awards and ‘Best Actress’ of 24th Entertainment Critics Assembly Awards.